I bet you don't know what "WC" means, do ya? I sure the heck didn't. In Germany, it's on every entrance to the restroom. 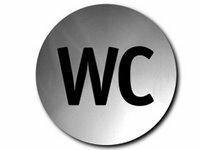 Yet, I never understood exactly WHY because Germans call a restroom a "toilette" (yes, I know it's French, but it's what they call a restroom), yet mark the door with "WC" signage. Really, what does it all mean? Unable to figure out on my own, I decided to be clever and develop a few clever meanings for WC of my own. Most of them are a bit vile, so I won't be sharing them. No matter how often I tried, I could never guess the meaning on my own. I caved and asked my German husband. "Water Closet", he replied. "Water Closet? ", I replied, almost angry that it was in English instead of some fancy German word ending with hosen or garten or nugen. Yup, water closet. If you want to totally confuse your guests, you can always pop one of these funky little circles on your bathroom door. For those of you that wished you lived in Europe, for a mere $9, a WC sign, and all the charm of the old world, can be yours. Shop at relish to view item, size, and more information.